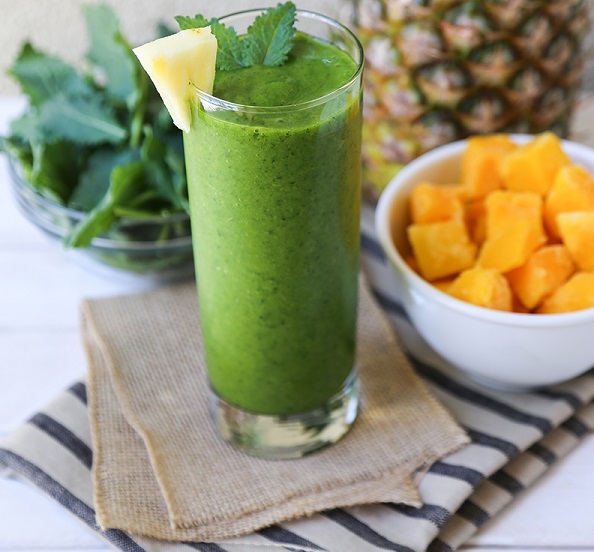 Juicing, blending, crushing, mixing…it’s all the rage these days! I never really jumped on the Juice Cleanse bandwagon, but I do love smoothies. The problem with most smoothies (especially those commonly purchased at big-chain smoothie shops) is that they are loaded with sugar. Not just from the fruit that decadently flavors the “Mango Tango” or “Pina Colada” blends, but also from the frozen treats and juices that are used in the recipes. Combine banana, ice and coconut water in a blender and mix on high speed until the ice is broken down. Add the kale and blend on high to break it down into the liquid. Finally, add the pineapple chunks and Arctic Zero, and continue to blend on high until you have a smooth, thick liquid. * BONUS: Add a small scoop of your favorite protein powder (vanilla tastes best in this recipe) and blend until smooth for a super-charged protein boost! Stay tuned for more delicious smooth recipes from the Edible Epiphanies Community and COMMENT below if you have a smoothie recipe you’d like to share!